EvaNavi Voice Tour Guide Introduced in S.F. You are at:Home»English»Nor Cal News»EvaNavi Voice Tour Guide Introduced in S.F. 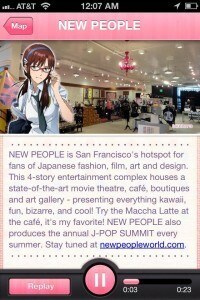 SAN FRANCISCO — New People Inc. has announced the debut of a useful new anime voice tour iPhone application that is now available to North American users. Developed and designed by KAYAC, Inc., the EvaNavi San Francisco Voice Tour Guide is a fun English audio app designed for the iPhone that incorporates aspects from the hit Evangelion 2.0 sci-fi anime property to guide users to 60 notable attractions around the city of San Francisco. The EvaNavi SF application is available for free download from the iPhone/iTunes AppStore at: http://itunes.apple.com/us/app/id549431695?mt=8. Anime fans, tourists, and even local residents can get to know the City by the Bay in an entirely new way with a unique audio guide powered by the voice of Mari Makinami Illustrious (voiced in English by actress Trina Nishimura) of the famed “Evangelion 2.0: You Can (Not) Advance” anime film. The EvaNavi SF application was specially developed and designed for North American fans by the Japanese IT creative company and web/mobile app developer KAYAC Inc. This special collaboration was also made possible by official support and approval from the creators of Evangelion 2.0, in association with NAVIelite (http://dribrain.com/). San Francisco is world-renowned for an array of unique restaurants, stores, landmarks and other points of interest. EvaNavi SF features many unique locations ranging from the Japanese pop culture entertainment complex of New People and the J-Pop inspired Hotel Tomo, to must-visit stops for anime fans and gamers such as the Cartoon Art Museum, the Super 7 collectables store, and Gamescape, as well as scrumptious Japanese eateries and live music venues such as Kiss Seafood, Juban Yakiniku House, Blowfish Sushi to Die For, and Yoshi’s San Francisco. The app also highlights many of the Bay Area’s non-J-pop attractions such as Citylights Bookstore, Radio Habana Social Club, Chronicle Books and many more “must” local attractions. The EvaNavi SF Voice Tour Guide launches in “EvaNavi Map” mode and shows 60 “must see” pop culture-inspired locations all over the city. Users can easily find the attractions nearest to them by turning on the app’s geo-locator and tapping the arrow to locate themselves by GPS. An easy-to-use “Spot List” mode quickly finds locations sorted by distance as well as in alphabetical order. Other features include one-tap playing and easy audio controls as well as on/off options for spot notifications. The application is compatible with iOS 4.0 and up and requires iPhone (3GS and up) with Internet or cellular data connection. Based in the seaside city of Kamakura, KAYAC Inc. was founded in 1998 and has developed a large proprietary portfolio of mobile and interactive products, including online communities, art projects, food businesses, and a variety of fun phone apps. The company has become one of the top creative agencies in Japan and several KAYAC games, available through major Japanese social game platforms, are enjoyed by millions of users across the country. The company is founded on the Japanese spirit of “omoshiroi,” meaning playful, fun and interesting. This spirit pervades all of the company’s products. Learn more at www.kayac.com/en. Based in San Francisco, New People Inc. (www.newpeopleworld.com) offers the latest films, art, fashion and retail brands from Japan through its unique entertainment destination as well as through licensing and distribution of selective Japanese films as well as various forms of entertainment. New People Entertainment (www.newpeopleent.com), strives to offer the most entertaining motion pictures straight from the “Kingdom of Pop” for audiences of all ages, especially the manga and anime generation, in North America.